I promised a longer post with more details, so here it is. I am very pleased to inform you that you that you have been selected to take part as a Language & Culture Assistant in the BEDA Program with Escuelas Católicas Madrid and Universidad de Comillas in 2012/2013. Congratulations! Further information will be communicated to you by email next week with dates for the course in September and details of your school and the hours. 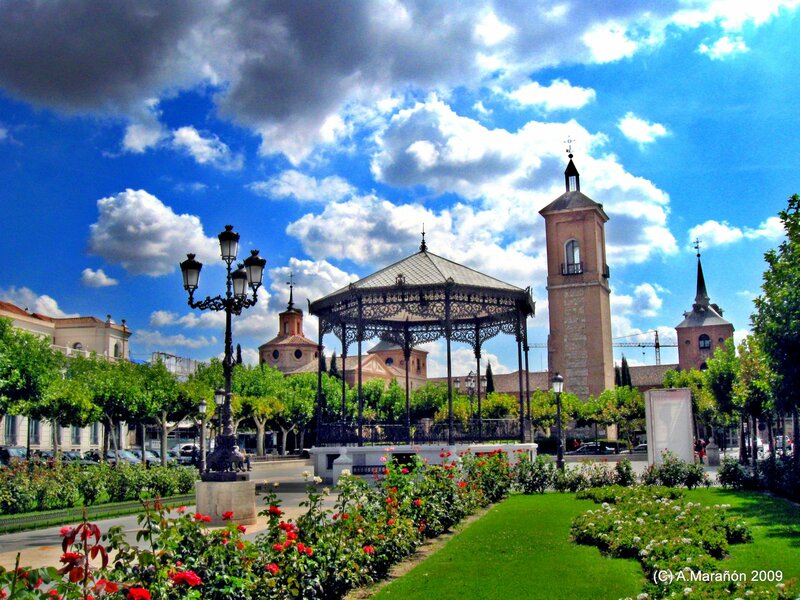 That is the Plaza de Cervantes in Alcalá de Henares. It’s only a few minutes from my school. Guess I know where I’ll be spending all my free time when it’s nice out! Now I really need to get cracking on all my visa paperwork. The email they sent us stated that we must be in Spain by September 12th so that gives me a a few months to get everything in order. Then I have to think about all the oh so joyous things like apartment hunting, setting up a bank account, getting my NIE, and a phone. Fun times ahead. Previous IT’S OFFICIAL!!! Next Auxiliares de Conversación Placements. I just got assigned too. Apartment-hunting is what scares me the most! Same! I’ve been looking at a few places and they all seem nice but I’ve been told by SO many people to not put down a deposit on a place that I haven’t seen with my own eyes so I’m waiting until I get there. At least the rent in the city I was assigned is pretty low, which makes me very happy. Where were you assigned? I feel the same. It’s really important to find somewhere close to one of the major stations too! I was assigned to a school right by Getafe Central, but I’m looking into just getting a place sort of North of Madrid and commuting. I commute a lot at home so I’m used to it. I completely understand! It kind of borders on obsession really…..sounds like you were lucky to get the 24 hours a week! I’ll be doing 16 a week….and I’ll be close to the center of Madrid…. I’ll figure something out. Wait….I just saw your other post saying that you are in Maryland????! haha too crazy. I live in Pasadena! Based on their facebook page, I don’t think you’ll have any issue getting some extra money with clases particulares. Did you apply to auxiliares de conversación through the ministry too or did you just stick with BEDA? It’s going to be so weird for me to hit the decline button when I get my placement from the ministry. It’s a crazy small world sometimes! I haven’t joined their facebook page yet..hmm…maybe I should do that now…. I did apply through the Ministry, but have not received an acceptance yet. I think I probably applied a little too late. I believe my number was 5000 something. If you have any insight on how to get the documents translated/notarized/Apostilled I would appreciate it. I’ve had some difficulties trying to get information out of the Embassy. I have my FBI “I’m not a criminal” document and also my medical document. It seems odd you have to go all the way down to the GB MVA to get your fingerprints taken. I went to a police barracks close to the airport for mine. My inscrita for the Ministry in 1711 so I’m thinking I’ll probably hear from them by the end of this week. Most banks have a notary, so if you don’t know one, I would try and call your local bank and ask them about it. I know that’s what a lot of people on the auxiliares facebook group were planning to do. My sister happens to work with a notary so that’s who is doing mine. If you send me a quick email to ladyinspain89@gmail.com, I can forward to you the email I received from the embassy with all the visa requirement details. Oh and I completely understand about having issues with the Embassy. It took about 5 emails before I finally got a response from them. And I ended up having to go to Glen Burnie because NONE of my local police stations do fingerprints anymore. I ended up having to call the state dept in Baltimore and have them make an appointment for me. It was a pain. Oh, also, do you know the name of the facebook group? I searched under BEDA, but nothing came up…. Congrats on getting accepted!!!! I’m glad my blog was helpful to you during the process 🙂 I’m excited to meet the new people next year! Hopefully, I’ll see you around Madrid.